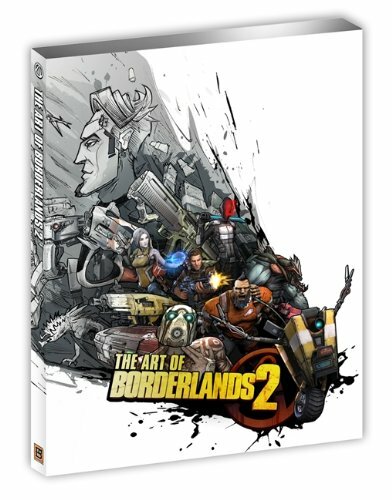 The Art of Borderlands 2 is a fantastic artbook for the stylish game. It's 272 pages, thicker than what I expected. Some places listed it with 208 pages. It's a paperback and the pages are quite thick. The concept art features the characters, weapons, environment, enemies, items & props, marketing art, and other miscellaneous art like user interface, etc. That is a load of art. Character designs takes up roughly a third of the book. The characters are great looking, comes with many sketches, and commentary. There's a nice comic style to them with the outlines. Selected have 3D renders. The environment art of Pandora's world covers Zone 1 to 3. The locations are beautiful. Unfortunately, some of them are printed rather small and the wonderful details are lost. The weapons section should delight fans who love the guns. There's a good amount of guns to look through, their variations and the many discarded concepts. No gun is too wild. The rest of the book features the other items like props, vehicles and promotional art. Commentary is everywhere. I like the parts where they talk specifically and technically on creating the style of the game, such as how they render the scenes, creating the day night cycle, developing the environments and of course the technology to creating the bazillion guns. This is a great video game art book. Highly recommended to fans of the game and art. It's well worth the money. Thank you for your reviews! Really useful resource.